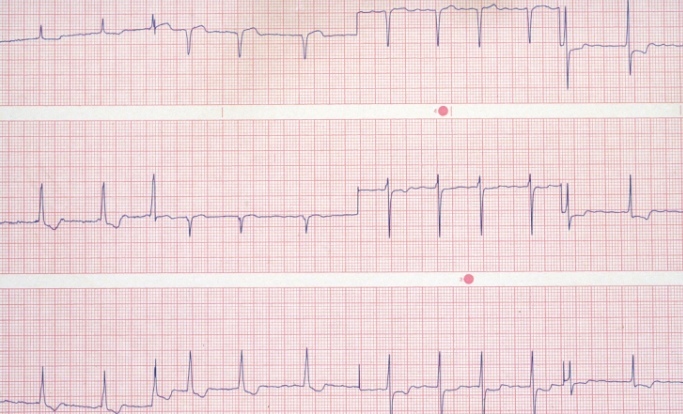 Researchers compared a targeted therapeutic approach with conventional therapy in patients with persistent atrial fibrillation. A targeted therapeutic approach for patients with persistent atrial fibrillation (AF) resulted in improvements in sinus maintenance as well as greater reductions in blood pressure, cholesterol, and weight when compared with conventional therapy, according to a study published in the European Heart Journal. In the Routine vs Aggressive Risk Factor Driven Upstream Rhythm Control for Prevention of Early Atrial Fibrillation in Heart Failure (RACE 3; ClinicalTrials.gov identifier: NCT00877643) trial, patients with early persistent AF and mild to moderate heart failure (HF) were randomly assigned to undergo a targeted treatment approach of underlying conditions (n=119) or conventional therapy (n=126). All patients with AF had an AF history of <5 years, and patients with HF were included if they had preserved or reduced ejection fraction with a left ventricular ejection fraction of ≥45% and a New York Heart Association functional Class II to III. Rhythm control therapy was provided to both groups, and electrical cardioversion was provided at 3 weeks. Patients in the targeted therapy group also received mineralocorticoid receptor antagonists, statins, angiotensin-converting enzyme inhibitors, and/or angiotensin receptor blockers. In addition, patients participated in physical exercise, underwent counseling, and followed a restricted diet. Primary end point comprised sinus rhythm presence at 1-year follow-up during 7 days of Holter monitoring. A significantly greater proportion of patients in the intervention group used mineralocorticoid receptor antagonists compared with control (101 [85%] vs 5 [4%] patients; P <.001), with similar findings observed for statin use (111 [93%] vs 61 [48%]; P <.001). Maintenance of ≥3 therapies occurred in 87% of patients, and all therapies were maintained in 58% of patients during the 1-year study period. A total of 89 patients had sinus rhythm at 1 year, with slightly more patients in the intervention group having sinus rhythm at follow-up than those who received conventional treatment (75% vs 63%, respectively; odds ratio, 1.765; with a lower limit of the 95% CI of 1.021, 2-sided P =.042). From baseline to 1 year, targeted treatment resulted in a significantly greater changes in systolic blood pressure (−3.28% vs 2.05%; P =.004), diastolic blood pressure (−8.95% vs −2.31%; P <.001), total cholesterol (−13.21% vs 1.65%; P <.001), and low-density lipoprotein cholesterol (−18.37% vs 0.40%; P <.001) when compared with conventional therapy. In addition, targeted therapy resulted in greater reductions in weight (−0.13% vs 1.35%; P =.025), body mass index (0.12% vs 1.37%; P =.023), and N-terminal pro-brain natriuretic peptide levels (−67.25% vs −37.26%; P =.014). The open-label design and the small number of patients are 2 potential limitations of this study. Also, the 1-year follow-up was not long enough to provide conclusive insight into the long-term benefit of targeted therapy in this patient population.